Bodhgaya is a small town in the state of Bihar and is one of the most venerated of the Buddhist sites in India. 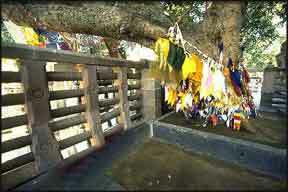 It is the place where Buddha attained spiritual enlightenment while he was meditating under the Bodhi tree. That particular tree later on came to be known as the Mahabodhi tree . Bodhgaya is also popular as a Buddhist learning center. Several important facts about Bodhgaya would further enrich the knowledge of the tourists before they embark on a tour to this splendid ancient city. The history of Bodhgaya can be traced back to the 7th century and it was the part of the first small kingdoms of India. This place came to prominence when a prince called Siddhartha gave up all the material pleasures and after strenuous efforts through meditation, attained enlightenment or Nirvana under a Bodhi tree. There is also a small shrine that was built under the rule of the great Mauryan ruler Ashoka in the 3rd century B.C. It is one of the most important places in Bodhgaya and should not be missed out during your trip to Bodhgaya. Located in the center of the state of Bihar, it lies in the northeastern region of India. It forms the part of the great Ganges plains and is on the banks of river Fagu. It is located at a distance of 13 km to the south of Gaya and 113 km to the south of Patna city. Bodhgaya experiences a tropical climate and the summers are unbearably hot. Bodhgaya can best be visited during the winters from the months of October to February. During the summer season, the mercury touches the mark 45-48°. You can wear light cotton during the summers and light woolens during the winter season. Holidays in Bodhgaya are going to become one of the most memorable ones since you will get an opportunity to understand the values of the Buddhist religion and the various Buddhist sites that are located here.